Dr. Thomas Sedran, Chairman of the Board of Management Volkswagen Commercial Vehicles, and Heinz-Jürgen Löw, Member of the Board for Sales and Marketing Volkswagen Commercial Vehicles, are presenting the study I.D. BUZZ CARGO at the IAA. 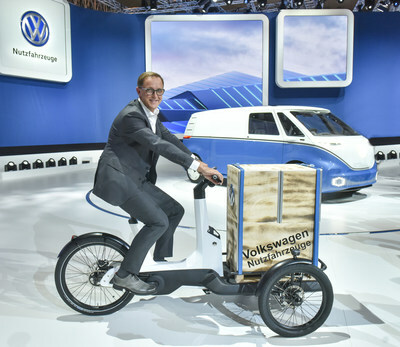 New solutions – ranging from the Cargo e-bike to the e-Crafter – for sustainable mobility for goods and people in urban regions – Volkswagen Commercial Vehicles is presenting at IAA Commercial Vehicles fair right now tomorrow‘s world of electrified transport and urban logistics – according to the brand‘s motto “Transporting your Future“. The Cargo e-Bike. In an in-house project, the brand developed a three-wheel cargo pedelec, which brand customers will be able to use to create more options for the “last mile” – tradesmen, for instance, could use it to ride to maintenance and service jobs with climate neutrality. The Cargo e Bike can carry up to 210 kg – including the driver – and can handle a cargo volume of one-half cubic metre. Equipped with a 250-watt mid-mounted motor with an automatic gearbox, it has a small turning circle and innovative tilt-compensating technology which always keeps the load platform horizontal. “Our Cargo e-Bike brings together all of the known usage and ride properties to make a perfect product”, emphasises Sedran. The ABT e-Caddy and the ABT e-Transporter. These two new, electrically powered solutions for urban traffic were developed in cooperation with VWCV’s strategic partner ABT, and they close a previous gap in the brand’s electrified model programme. With the kick-off of the e-Crafter, retrofit solutions have already been prepared for the small vans and city delivery vehicles that will arrive in the market in early 2019. Battery capacities are 36 and 72 kWh. This enables the vehicles to cover a range of 200 or 400 km. 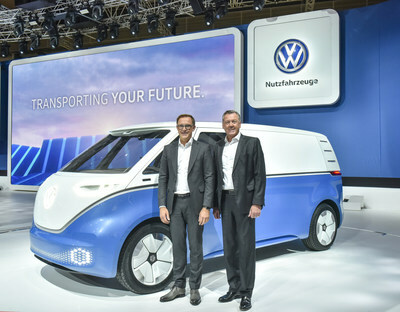 Thomas Sedran outlined that despite progress made in the seamless electrification of its products, Volkswagen Commercial Vehicles would continue to rely on highly advanced diesels as the backbone for logistics of many branches and operational purpose – long distance runs, in rough terrains and for heavy loads. In Hannover – from 20 to 27 September 2018 – Volkswagen Commercial Vehicles will be showing 50 vehicles of all model series in Hall 12 of the exhibition centre and 21 more vehicles in the outdoor exhibition area. Show visitors can also test drive an additional 37 vehicles at the ADAC test track. All around the globe we offer the best transport solutions for our customers. As a stand-alone brand within the Volkswagen Group, Volkswagen Commercial Vehicles is responsible globally for the development, construction and sales of light commercial vehicles, producing the Transporter, Caddy, Crafter and Amarok ranges. In consultation with its customers, Volkswagen Commercial Vehicles draws up appropriate vehicle concepts, telematics and logistics solutions for the sparing use of resources at the highest possible level of efficiency. In 2017, the brand sold around 498,000 light commercial vehicles, produced at its sites in Hannover (D), Poznań (PL) and Września (PL) and Pacheco (ARG). Volkswagen Commercial Vehicles employs over 21,000 people globally.